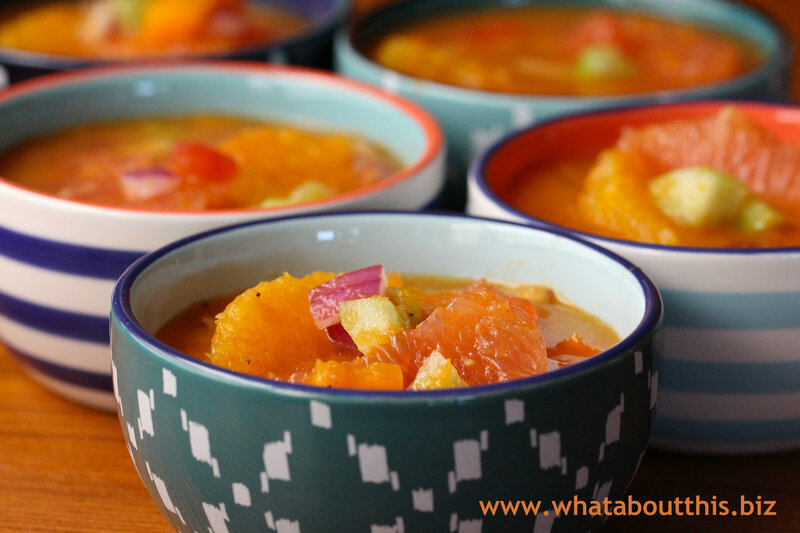 Citrus Gazpacho | What about this? A trip to the American Southwest and blistering hot days prompt me to explore the world of chilled soups. After eating at Cafe Pasqual’s, a James Beard America’s Regional Cooking Classics award winner, in Santa Fe, New Mexico, I left a few pounds heavier. Not only did I eat every bit of food that was placed before me, I also toted home two of Cafe Pasqual’s cookbooks in my suitcase. In one of the books, Chef Katharine Kagel shares a much-requested recipe for a refreshing citrus-flavored gazpacho. 1. Fill a large saucepan with enough water to cover the tomatoes. Place over high heat and bring to a full boil. While the water is heating, use the tip of a sharp paring knife to score a small X on the bottom of each tomato, just piercing the skin. 2. Put the tomatoes into the boiling water for 20 seconds. Use tongs to transfer the tomatoes to a large bowl filled with ice and water. (This will stop further cooking.) Allow the tomatoes to cool for a few minutes, remove them from the water, and peel their skins with either a paring knife or your fingers, starting at the scored end. Discard the peel. 3. Core and dice one tomato and reserve it. Slice the other tomatoes in half crosswise, and squeeze out the seeds. Remove the cores. Put the tomatoes into the container of a blender. 4. Place the garlic, vinegar, orange juice, and orange and grapefruit zests into the blender with the tomatoes and whirl. Transfer the puree to a serving pitcher or a serving bowl and add the cucumber, bell pepper, red onion, and olive oil. 5. To prepare the fruit, use a paring knife on a cutting board to cut off both ends of the grapefruit and orange so that the fruit can securely stand on end for cutting. Starting from the top of the citrus, slice off all the peel and pith, following the contour. All the fruit will now be exposed. Cradle the fruit in the palm of your hand you aren’t using for slicing, and use the paring knife to cut loose each fruit segment from the inner side of the membrane. Angle the long side of the blade between the fruit and the membrane toward the center of each segment, cutting in a V configuration. No membrane should be attached to the fruit segments. 6. Add the fruit segments to the gazpacho mixture and stir. 7. Add the salt, pepper, and cayenne to taste. 8. Chill well before serving. 1. I couldn’t find pink grapefruit at my local market, so I used a red grapefruit instead. 2. The recipe didn’t indicate when to add the reserved diced tomatoes, so I added them in with the cucumbers, bell pepper, and red onions. 3. I added 1/8 teaspoon of cayenne pepper. I will definitely be making this. Thank you. I had this wonderful gazpacho sometime during the 1990s, successfully recreated it, but did not write down my recipe. Now I can make it again. Thank you!